Be it your living room or the office, carpet has become an essential aspect of decor. Carpets not only add to the decor by using colour, pile heights, patterns but insulate floor as it caters a psychological feeling of warmth. But one downfall of carpet that cannot be ignored is that it gets stained, burned, ruined, stretched or ripped and you ultimately replace it new carpet. Is patching a carpet, the solution? If yes, carpet repair services are no easy approach that just about any homeowner can do it yourself. Spills, cigarette burns or any other infelicities make it a compulsion to remove the part by repairing the damage or completely changing it. Felicitously, the ways mentioned below will help you to achieve your carpet cleaning goal. Regular Rotation Of Furniture – By rotating the furniture, you can diminish the damage. Ensure your child or pet do not jump on the furniture as it will put pressure on the legs and will crush the carpet. Small Rugs In The Entryway – With a welcome mat kept outside the indoors you ensure that a lot of dirt is left outside and can limit the minimum amount of dirt on the carpet. Regular vacuum – Vacuuming the carpet regularly, seems tough, right? But this deed can boost the durability of the carpet. It won’t just help you to keep the carpet new but also reduces symptoms of allergy. Furniture Coasters – Adding furniture coaster will distribute the weight of heavy furniture and even works as shock absorbers. You can move furniture’s more easily with the use of these coasters. Carpet Pads – You can use carpet pads to lengthen the life of carpets. Apart from that, they act as shock absorbers to prevent the carpet rubbing across the rough floor beneath. Take Preventive Measures – Save your carpet by instantly cleaning spills. It becomes more effective if you remove the spills at the earliest. Steam Cleaning – Just like regular vacuuming is essential deed, steam cleaning the floor once a year is a must. Steam cleaning is a professional carpet repair service that works as an effective solution for harder and stubborn stains. This is cheaper than changing your carpet! Carpet Treatment – One of the best preventative care is to apply stain and soil resistant treatments available in the market on the floor. This is applied when your vacuüm cleaning fails to give you required satisfaction. Prevent Direct Sun Exposure – Ensure you keep your carpet away from the sun for durability of your carpet. Direct exposure to sunlight can slowly alter the colour and damage carpet fiber. Thus it’s better to keep blinds or curtains closed when you are away from the room. This will help you to cool your room even. 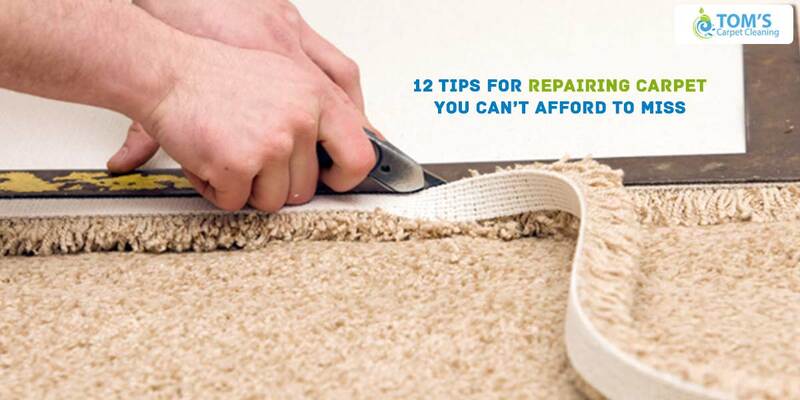 Repair Patches – The moment the carpet gets ripped, stained or burned, it’s time to repair the patch. So measure the patch area, tape off the area to be removed, use a cutting utensil to remove the damaged section, prepare the carpet to receive patch by using adhesive and later smooth the patch after moving the carpet patch into place. Patch Pad – One more optimal technique to enhance the life of your carpet is to use the carpet pads. These are specially made adhesive disks that activates when in contact with heat, meaning they act as shock absorbers to ensure the carpet maintains its durability. Threshold Replacement – When the carpet is loosened from the threshold, time is to change the existing carpet with a new one, as the bubbles generated and lifting the carpet can later harass you. So to ensure threshold is working right, you can replace it. We hope you loved the points mentioned above and would want to do it by your own with a little care. If not, you can seek Toms carpet repair service near you.